Well, we finally did it. We built the world’s first and largest exhibition about the Rubik’s Cube. 7,000 sq ft of games, puzzles, history, art, and engineering, all inspired by Ernő Rubik’s best-selling masterpiece. Whether you’re Mats Valk or just looking for an excellent way to spend a summer day, Beyond Rubik’s Cube has something amazing you’ve never seen before. Young visitors can make thousands of elaborate creations with our oversized foam shapes. A pair of blocks becomes a wall, walls make rooms, and rooms become houses. Inspired by creativity and teamwork, children can design and build anything from dinosaurs and giant robots to castles with moats and long, winding ball chutes. Our Cupcake Kids! class series is all about Cupcakes – vanilla, rainbow, confetti, pinkalicious and more. Each class we whip up a new cupcake recipe from scratch or start with a fresh cupcake and learn fun and easy decorating techniques. This is a fun family class so register with your siblings, cousins and friends. Class size is limited to 10 students which allows our budding chefs to participate in an unique kitchen environment where they learn, laugh and cook together. Starting with our youngest chefs at age 2 on up to our advanced middle school classes, we have a class time for everyone that is sure to be the highlight of their week. Check their website to see what the theme of the cupcakes is for the class. The Greenmarkets at Grand Army Plaza and Bartel-Pritchard Circle bring the best and freshest in upstate produce, dairy, and meat to the heart of Brooklyn. Every Saturday, you’ll find over 600 varieties of farm-fresh fruits, vegetables, baked goods, dairy products, and more. All food is grown and produced by regional farmers specializing in organic, unprocessed, and free-range products. You’ll find everything from blueberry wine and goat cheese to one hundred varieties of apples and fresh-picked flowers, plants, and seeds. Over half the farmers at the Grand Army Plaza Greenmarket are able to accept credit cards and EBT/food stamps. The Greenmarket is a program of GrowNYC and was developed to support local farmers while offering over 600 varieties of delicious farm-grown products to City residents. The public can enter the Sculpture Garden directly through the gates on West 54 Street, between Fifth and Sixth avenues, or through the main lobby entrances on West 53 and West 54 streets. Coffee and beverages will be available for purchase. Early morning hours in the Sculpture Garden will be in effect year-round, weather permitting. 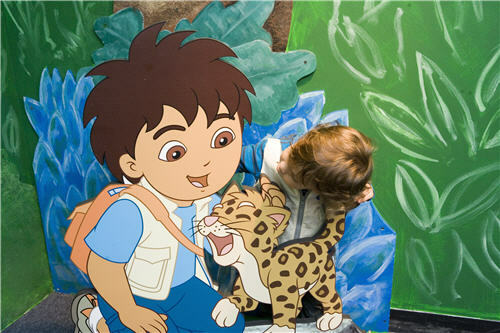 The Museum galleries open to the public daily at 10:30 a.m.
Join Diego on a series of high stakes animal rescue missions. Learn facts about animals and their habitats by helping Diego rescue animals in trouble. Explore a cave, a beach and the rainforest, or rub animal footprints, even build a Spectacled Bear’s nest! Get ready for a fabulous fiesta at Dora’s house! Drive Tico’s car, build the walls of Rainbow Bridge or jump across the lake to arrive at Dora’s house to play drums and pretend to cook Latin American foods. By helping Dora and her friends get to the fiesta, your child will learn problem-solving skills, develop math and language abilities, and gain a greater appreciation and awareness of Latin American culture. ¡Vámonos! Let’s go! Sponsored by Nickelodeon. Inaugurating the new Anne Frank Center USA downtown is the initial portion of its permanent exhibit, "Anne Frank and Us." 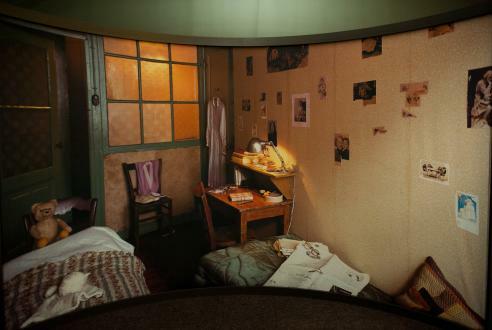 In a space that re-creates Anne Frank's bedroom in the Secret Annex, kids can sit and reflect on the life of the brave diarist, who bore witness to life's wonder and her own fears even as she hid with her family in an attic during the Nazi occupation of Amsterdam. Audio loops of sounds she would hear—church bells ringing, wind in the trees—and quotations of her diary let children connect to the young writer viscerally. Other kid-friendly offerings include a dollhouse-like model of the Secret Annex, facsimiles of her diary and family photo albums, and the 26-minute video "The Short Life of Anne Frank." 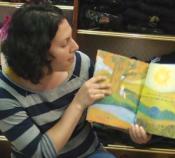 Come bring your babies and toddlers for rhythm and story time! 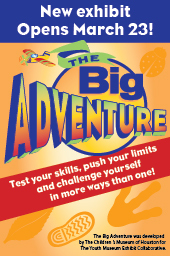 The Big Adventure exhibit opening to general public. Test your skills and push your limits with our new visiting exhibit! Partnering with Icelandic singer andartist Björk, and the New York Public Library, CMOM presents Biophilia, a suite of nine musical compositions with accompanying games, images and videos that encourages users to explore the connections between music, nature and technology. Using provided iPads, CMOM educators will conduct workshops, guiding families through the Biophilia apps to foster creativity and inspire children to tap into their own musical creativity. In addition to discovering Björk's music, children and families will also explore the themes of Biophilia while enjoying hands-on science experiments, movement, dance and even music theory.